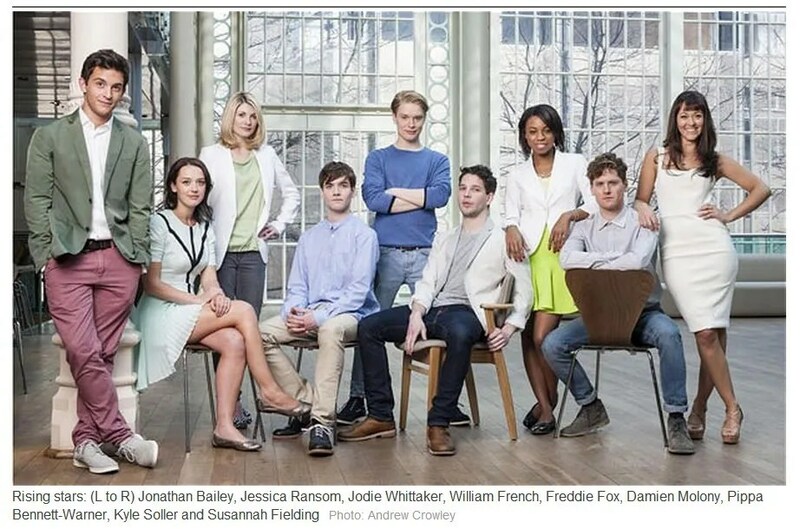 Damien appears alongside 8 of the “brightest up and coming actors currently starring on the West End stage” in this ‘A Constellation Of Future Stars’ photoshoot with The Telegraph, at the Royal Opera House at the Olivier Awards last night. Current role Touring in the National Theatre’s production of Travelling Light. Greatest influence My parents, who financially and emotionally supported me coming from Ireland to England to train to be an actor. I wouldn’t be doing this without them. Acting hero Marie Mullen, who is one of the founders of Galway’s Druid Theatre company. I saw her in A Long Day’s Journey into Night four years ago and it was one of the most exciting performances I had ever seen. Dream role Shaun the Post in Boucicault’s Arrah-na-Pogue. He is so in love and so romantic and charming. Favourite TV This is England 88. The performances were amazing. What I’m reading In the Blink of an Eye by the film editor Walter Murch. It’s fascinating about the mechanics and magic of film. What I’m listening to Baxter Dury’s Happy Soup. Career high Working with Antony Sher and Nicholas Hytner right now. How can we not but wholeheartedly agree with the final sentence of the article by Bernadette Mcnulty of the Telegraph? Discuss this article with other fans over here!